Welcome to Girl Prep Online! I feel like I’ve always been a very sympathetic person. I’ve always been the mother in my group even when I was like five or six years old, because I always put myself in other people’s shoes. I think it also has a lot to do with my upbringing. My parents are Buddhists and they raised me Buddhist. They taught me the importance of respecting people and understanding where people come from and doing whatever you can to help humanity. I was very insecure growing up. I was very emotional and very sensitive. I would never put people down because I knew how it felt. I had low self esteem. And I think that’s what got me into Girl Prep, which is a youth empowerment conference for girls 10 to 13, because I wanted to do something where I would work with girls and with self esteem. We put them through leadership workshops and goal setting. I’m really grateful to be a part of something like this, because I think especially with self esteem, it’s the root to everything really. It’s how you view yourself, it’s going to be how you view your life, it’s going to determine if you feel like you’re worthy enough or you have what it takes to accomplish your goals. And if you don’t have self esteem or if you have really low self esteem it’s going to be much more difficult to do so. It’s a blast and an honor. I feel like I take so much from it and I feel like I’m learning about self esteem and everything just by talking to these girls about it. GIRL PREP Creative Director Jenesis A. Harper,13, poses at the 3rd Annual GIRL PREP Conference on May 1, 2010. The 3rd Annual Girl Prep Conference took place at the Renaissance Hotel in Los Angeles, CA today where the 2010 Faces Of Girl Prep were on hand to help inspire young girls to build self-confidence and find their voice within. The faces of Girl Prep combined a team of young powerful hollywood actresses to act as role models for todays youth, including Ashley Argota, Francia Raisa, Anna Maria Perez de Tagle, Amber Stevens, Maiara Walsh and Tamala Jones. Other celebrity supporters in attendance were Monique Coleman and Kym Whitley. Girl Prep was created to motivate and enhance the abilities of young women; elicit open and safe interactive dialogue between facilitators and participants; empower the participants to make realistic self-assessments in their lives, and develop their goal-setting skills for personal, educations and professional achievement. In a Perfect World served as the event’s title sponsor for the third year in a row. Other sponsors of Girl Prep Hollywood include Rossi Public Relations, Towanna Freeman & Associates, and Beyond the Balloon. 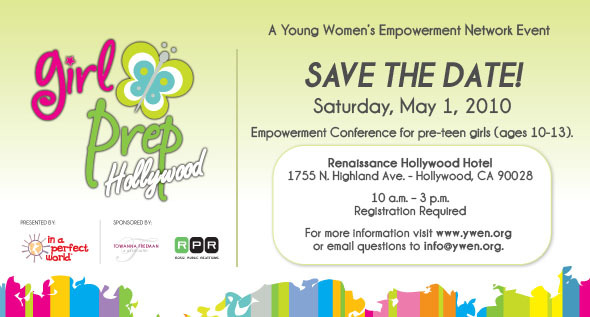 Girl Prep is the first empowerment conference event of its kind developed to reach and teach pre-teen girls ages 10-13. Our mission is to promote community activism and leadership; to give girls a greater voice and access to opportunities and organizations in their communities. » Celebrity guests from your favorite shows on the Disney Channel! by emailing towanna@ywen.org or calling 703.675.2111. View Clips below, from the 2009 GIRL PREP Hollywood. Source: Maiara Walsh: Bright Young Thing. From the imagination of a little girl and the branding ingenuity of her mother Caryn, Savanna’s idea spawned the latest tween craze in cool, fun fashion — MYZOS”. Currently sold nationwide in Nordstrom and in the trendiest boutiques including Fred Segal and Kitson, MYZOS” CEO Caryn Sterling today announced Colors for Causes in partnership with JDRF, just in time for their annual fundraiser. Get empowered! The Young Women’s Empowerment Network and In a Perfect World recently hosted Girl Prep, an empowerment conference for girls aged 10-13. What is an empowerment conference? Well, it involves celebs(!) and giving girls a chance to make a difference in their communities. The Girl Prep conference, which took place on March 28 in Hollywood, (hosted by Maiara Walsh from Corey in the House and Brando Eaton from Zoey 101!!) gave disadvantaged teen girls access to cool opportunities and a chance to meet cool celebs like Miley, Hayden, Jason Dolley, Corbin Bleu, and Carlisle, Jasper, and Emmett from Twilight (or rather, their real-life counterparts, Peter Facinelli, Jackson Rathbone, and Kelln Lutz)! admission for one (1) girl. admission for five (5) girls. admission for ten (10) girls.